KILLINGTON – Killington resident Gary Roth recently won gold in advanced eight-way formation skydiving at the 2016 U.S. Parachute Association National Skydiving Championships at Skydive, Arizona, held Oct. 20-29, according to a Nov. 8 press release. Roth won the event with his team, affectionately named Sugar Free Haribo Gummi Bears. The National Championships drew nearly 500 skydivers from across the country vying for medals in five different skydiving disciplines. 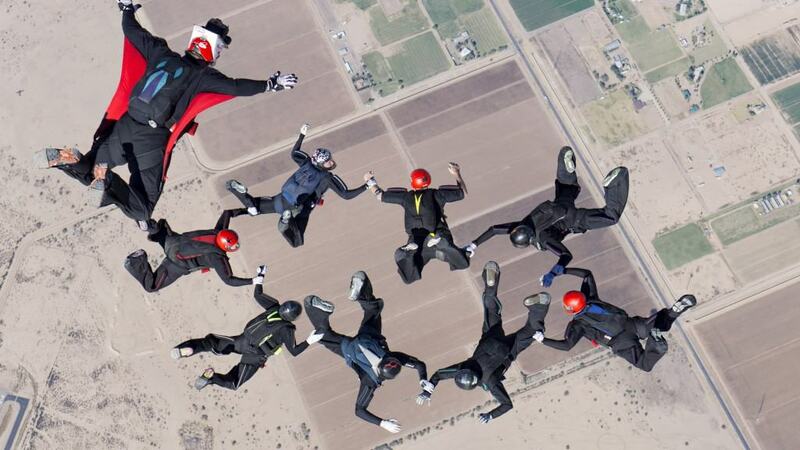 In formation skydiving, eight-person teams exit the airplane more than two miles above the ground and race against the clock to form prescribed geometric formations in freefall before opening their parachutes. A videographer jumps with the team to capture the maneuvers for the judges on the ground. Roth, 48 who works as the fire chief in Killington, Vt., has more than 5,000 skydives. For more information, visit www.uspa.org. Gary Roth,chief of the Killington Volunteer Fire Department, and his team Sugar Free Haribo Gummi Bears wins gold in national skydiving event held in Arizona.